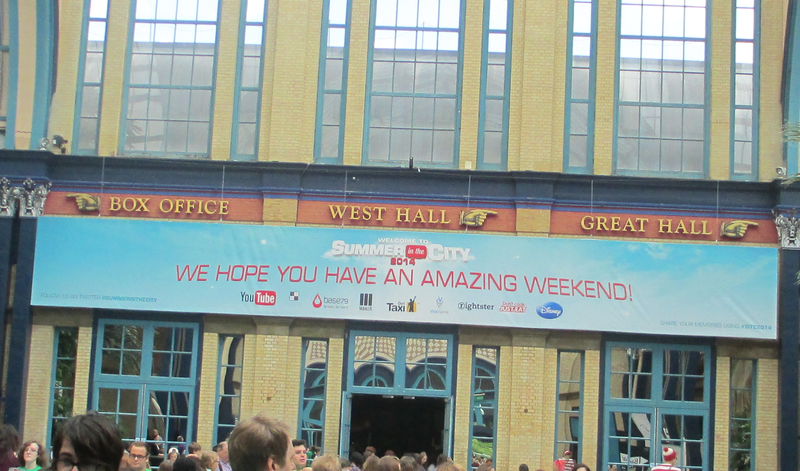 Last weekend I travelled down to London for Summer In The City 2014 and it was honestly one of the best things I have ever done! I started watching YouTube videos in March 2013 and that opened me up to the whole YouTube and Blogging world and being able to attend this was amazing! To meet and see people who have inspired me to do what I have done or what I want to do. I didn't get to meet everyone that I wanted to meet as it was a bit crazy with the queues but still met quite a few and saw them on panels/on stage. The whole ticket system at meetups was a little disorganised with some volunteers giving out tickets hours in advance when we were told they were giving them out half an hour before but with thousands of people wanting to see one/two people there was no way to please everyone from their point of view. On the Saturday we arrived an hour earlier but with a few thousand people already in front of us we didn't get in until after 12 so we didn't get to meet Zoella who was the first ever YouTuber I ever watched and she means a lot to me. We just wandered round for the first while, not making any of the bigger meetups as all the tickets were given out before we even got there. We watched the LGBTQ+ panel with Tyler Oakley which was really interesting and we also watched some of the Music Panel. We then watched a Q&A panel on the main stage with Patty, Emma, Luke and Jason, the Women on YouTube Panel and Glitter Time with Louise although we were standing at the very back so didn't see much as I'm so short. They were all brilliant! Back in the main room I met Rhiannon from FashionRocksMySocks. She is a big inspiration of mine when it comes to my blog, I love her fashion sense and she has such a lovely personality! We also met Louis from FunForLouis. I love his vlogs and they really get me excited to travel the world and do a few crazy adventurous things. Travel is something I love so much and I can't wait to do more of it. We then stayed by the main stage til the end watching Tyler Oakley, BriBry and Dan and Phil Live. For the Sunday we had the brilliant idea of arriving at 8. Turned out not so brilliantly. The lovely English weather decided it wanted to give us a thunder and lightning storm a long with a lot (and I mean a lot) of rain. The picture above shows us (Me, Sorcha and my sister Aoife) when it was just trickling. In the end they let us in an hour early after all 6/7 thousand of us chanted "LET US IN" and some people started to get hypothermia. We got in and went straight to the meetup lines as we were one of the first people there. We didn't make Tanya Burr but we got tickets for Jim Chapman. We were still dripping wet and cold but I bought a hot chocolate and a (dry) Dan and Phil t-shirt. Next we went to Glitter Time (again). It was so good the first time, plus we didn't see much so we went the second time but with a Q&A it's different both times. I was cry-laughing through most of it as she is so good and seriously should be a stand up comedian, she's so great live! Back at the main stage we watched Joe and Caspar's Q&A, Musical Bethan and As It Is. All amazing and so good live! Then was the amazing Emma Blackery! Watching her perform live was incredible! And then of course she shaved her head on stage, which raised over £26,000. It was such a great thing to do and I am so proud of her! The moment made me really want to do something with my life and not waste it away as I often do. It finished up with Jack and Dean doing a live sketch which was a lovely funny way to finish up! The whole experience was just incredible and inspirational and definitely one of the best two days of my life. I learned so much and had a great time. I can't wait for next year! I'm Étáin (it's pronounced ay-toyn). I'm a little 17 year old girl living in the middle of nowhere in Ireland. I blog about fashion, photography, beauty, crafts and travel. I also chat about the weather a lot. "Quiet people have the loudest minds"
Visit Étáin's profile on Pinterest.